Brutus showed his smaller piglet pals who’s boss at the Arlington County Fair on Thursday. Piglet racing – a popular draw at the annual event – allows the 17-week-old Brutus to showcase his running, trotting and swimming skills. “Pig racing has become such a huge phenomena,” said Ken Freile, from Sue Wee Flying Pig Racing. Indeed, the crowd cheered wildly as Brutus and three other piglets rounded the corners and squealed past the checkered finish line. But the real crowd pleaser was the final race, which included a small pool that the piglets swam across. Weighing in at 20 to 27 pounds, the four piglets – all with catchy names like Jerry Swinefeld and Ham Solo – raced around the track in the back of the fairgrounds. “The louder you cheer, the faster these piglets will run,” Freile told the audience. There’s still plenty of time left to catch these little ‘lets in action. 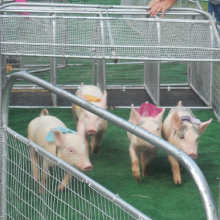 Pig racing will continue Friday, Saturday and Sunday.